Scratchbox  is a cross-compilation toolkit designed to make embedded Linux application development easier. It provides a full set of tools to integrate and cross-compile an entire Linux distribution. Scratchbox supports cross-compiling for ARM and PowerPC targets. Especially Debian  is supported, but Scratchbox has also been used to cross-compile e.g. Slackware for ARM. Scratchbox provides a sandboxed build environment which offers a controlled set of tools and utilities needed for cross-compilation. It is an environment in which it is easy to assure that the intended versions of libraries, headers and other similar files are used during the build. Most of the higher level software built using GNU Autotools do not cross-compile well in their as-is form, Scratchbox solves this problem by allowing the small test programs (used by the configure script to test for availability of features in the environment) to run transparently either using an emulator or through sbrsh protocol between Scratchbox and actual target device. In practice software configuration and building using Scratchbox is quite identical to how it's done for the desktop. Scratchbox has been designed to allow multiple application developers work simultaneously on a single host machine. Each developer has his private user account, and all configuration is developer-specific. This document describes Scratchbox install procedure and how Scratchbox can be used to cross-compile applications to ARM target platform. Linux distribution installed on the host. For multiple users using Scratchbox on the same host a dual CPU machine or Hyper-Threading capable processor is recommended. For multiple users using Scratchbox on the same host at least 1 GB is recommended. Full Scratchbox installation requires 1 GB of hard disk space, but you should reserve at least 1 GB extra space for each Scratchbox user. For heavy development you might need at least 10 GB of space. Your kernel has the binfmt_misc module which is required by the CPU-transparency feature. On most Linux distributions it is available by default (not on RedHat Enterprise Linux 3). You have a suitable ARM distribution installed on the device. Recommended Linux distributions are Debian and Familiar 0.8 . Network between your host machine and the ARM device has been setup and works correctly, see: Support distribution installation instructions or How to setup iPAQ networking in Familiar. Having sshd on the device is recommended. Section 2.4 describes how to set up a Scratchbox target to use the ARM device. You can also build custom toolchain packages. See Scratchbox toolchains . Scratchbox packages are available for Debian and RPM-based systems. You can install Scratchbox from binary tarballs for other Linux distributions. Installing from Debian packages and tarballs is described in the following sections. You will need root privileges for this part of the Scratchbox installation. If '/' directory does not contain enough space for Scratchbox it can be installed to some other partition by creating a symbolic link from '/scratchbox' to desired place with command: ln -s /opt/sb /scratchbox. After downloading Scratchbox will be unpacked to '/scratchbox' directory and the installation procedure will ask you some questions about the group and user accounts. Default group to Scratchbox users is 'sbox'. Group can be renamed but default should be fine unless you have LDAP or similar network authentication scheme. If network authentication is used using an existing group is recommended. It will automatically include users to the Scratchbox group, create user directories under '/scratchbox/users' directory and mount several directories (/dev, /proc, /tmp) under user directory. This is all that needs to be done for basic Scratchbox functionality. To be able to cross-compile more complex software you need to enable the sbrsh feature (see Chapter 3). You need root privileges for this part of the Scratchbox installation. Obtain necessary packages from Scratchbox download area . Answer questions (defaults should be fine). This creates 'sbox' user group and setup Scratchbox. This adds the user to 'sbox' user group, creates the Scratchbox user directory under '/scratcbox/users' directory and mounts several directories (/dev, /proc, /tmp) under user directory. If it prints out the sbox group name, you're ready to start Scratchbox. If you have installed Scratchbox from Debian or RPM packages, you can use /usr/bin/scratchbox to start Scratchbox. When you login for the first time, Scratchbox copies the terminfo terminal capability database to your Scratchbox home directory (/scratchbox/users/<username>/home/<username>/) and creates the default HOST target. Because Scratchbox is a fully self-contained sandbox, it doesn't inherit anything from the outside system except for the environment variables. You can copy your configuration files from your normal home directory into your Scratchbox home directory: .bashrc (Scratchbox uses the bash shell), .bash_profile, .vimrc, .inputrc, .cvspass, etc. New targets can be created using the menu-based sb-menu utility. The same functionality is also available via the sb-conf and sbrsh-conf command-line utilities, but they are not described in this document. The sb-menu command is available inside and outside Scratchbox. If you are using the Debian or RPM packages, you can use the /usr/bin/sb-menu command outside Scratchbox; the /scratchbox/tools/bin/sb-menu command is included also in the tarballs. We use "MYTARGET" as the target name in this example. We selected gcc 3.3 that creates binaries for the ARM architecture and links them against glibc 2.3. At this point we don't need any. Just select the DONE option to proceed. The QEMU emulator is sufficient for our example target, so select 'qemu-arm'. Now the setup is done, but sb-menu asks if we want to extract a rootstrap and/or install system files on the target. Answer no to the rootstrap question but choose to install files. The default selection is fine, so you can just press enter to install them. Everything is now ready and we can activate the target by answering yes to the last question. Scratchbox is now ready for cross-compilation for ARM with the help of the QEMU emulator. QEMU is suitable for basic use but sbrsh with an actual target device should be used for advanced requirements (see Chapter 3). If support for more complicated programs (for example GUI software) is needed, the libraries that they use should be installed on the target. One option is to compile them from sources and another is to use prebuilt binary packages. If you are using the Debian devkit, you can use apt-get to install packages on the target (see Section 4.3). Sbrsh is an alternative to QEMU for implementing the CPU-transparency feature of Scratchbox. It runs the configure scripts' test programs on a remote device with the CPU architecture used by the cross-compilation toolchain-typically the device that you are developing software for. Some build systems also benefit from it when they attempt to execute a target binary which is used to generate data files. Running programs on an actual target device is more reliable than emulating a specific device because emulators might not support all required features or there might not be an appropriate emulator available at all. Sbrsh requires that the user's home (build) and target directories are available on the target device. This is done using NFS, so you have to setup your machine to export the required directories. NFS setup has to be done as root. NFS is inherently insecure so you should run it only on trusted networks. On Debian, the 'nfs-common', 'nfs-kernel-server' and 'portmap' packages are needed. On RedHat you need the 'nfs-utils' and 'portmap' packages. Now the NFS server can be started. This is all that needs to be done for the NFS configuration in order to use sbrsh. Alternatively the NFS server can be restarted. You could also stop the NFS server. If you remove a Scratchbox target and create a new target with the same name, you need to restart the NFS server before you can use it with sbrsh. If you just want to clear the target, you should reset it instead of removing since it does not require an NFS restart. In order to use sbrsh you need to install and start the sbrsh daemon (sbrshd) on the target device. It needs to be run as root, so you need root access. If you are have a Debian installation on the target device you can install sbrshd from a Debian package. You can find it from the /scratchbox/device_tools directory tree of your Scratchbox installation or from the APT repository at scratchbox.org. See Scratchbox Remote Shell  for detailed sbrshd usage information. Sbrsh needs to be configured for each Scratchbox target it is used with. 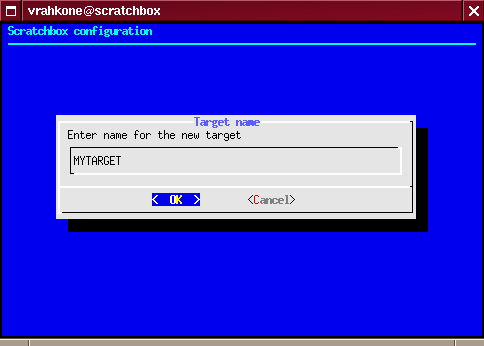 The configuration is saved in the '/targets/<targetname>.sbrsh' file inside Scratchbox. It contains the hostname of the target device and the port where the sbrshd listens at, and lists the NFS filesystems that need to be mounted and directories that need to be bound in order to recreate the Scratchbox sandbox at the device end. First we need to specify the hostname or IP-address of the target device. If you have configured the sbrshd to use a nonstandard port you can specify that as well. In our example the device has been connected to the Scratchbox host via a local USB network and we have assigned the IP-address 192.168.0.202 for it. We are running sbrshd at the default port (1202) so we don't need to specify it. The next dialog shows the default hostname of your Scratchbox host. It is used to mount the NFS filesystems on the target device, so you may need to change it to an address that is known to the device. We need to specify the IP-address that is assigned to the Scratchbox host in the USB network. In this example it is the gateway: 192.168.0.200. You should say Yes if you didn't configure the permissions while installing sbrshd. Now sbrsh is configured for the target and you have returned to main menu. Select exit and proceed to test your new configuration. Sbrsh can be tested by repeating same steps that were done in testing installation section (see Section 2.5). This time the only difference is that target binaries are executed on real hardware instead of being emulated. This section describes how to set up a Debian environment inside Scratchbox. The Debian development kit offers tools for creating Debian packages in the same way they are created on a native Debian system. After the devkit is installed, a target that uses Debian devkit must be created (or an existing target must be reconfigured). You can follow the instructions in Section 2.4 but select 'debian' at the devkit selection menu. The building of Debian packages needs to be done inside a 'fakeroot' environment. By default Scratchbox can only run its host tools inside fakeroot. In order to run target binaries in fakeroot, the libfakeroot binary needs to be installed on the target. If you used the default settings in the file installation menu (see Section 2.4), then you have installed fakeroot and you are set. Otherwise you need to go back to sb-menu and install fakeroot. Debian devkit is tested by building some Debian packages. In this section we will build and install ncurses. It is easy to build because it does not have dependencies to other libraries than the C library and it does not require exotic build tools. Building more demanding packages is described later (see Section 4.3). Select the target that you have configured to use the Debian devkit. [sbox-MYTARGET: ~/ncurses-5.4] > cd .. In the previous section we were able compile ncurses because Scratchbox provides its only explicit build dependency: debhelper (it has more build dependencies but they do not apply on the ARM architecture). 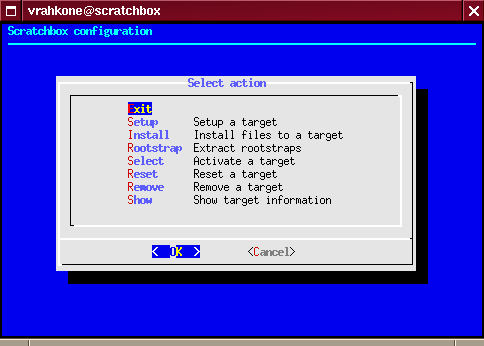 Scratchbox provides only build tools and other utility programs; any libraries and related development files a package depends on must be installed on the target. It proposes to install about 45 packages. libc6 is installed over the C-library you installed using sb-menu. base-files wants to overwrite the '/etc/nsswitch.conf' file (also installed by sb-menu), which is okay. sb-install-base-packages does not install bash even though it is essential, because its Debian package has known problems installing on Scratchbox. This should not be a big problem though, since Scratchbox provides bash. This time apt-get proposes to download about 62 packages. You should use sbrsh to install GTK+ libraries, because their post-installation scripts are known to fail with QEMU. It is not necessary to use fakeroot with Scratchbox's apt-get, but some packages check that their post-installation scripts are run as root, so it's best to use fakeroot when installing packages. You can extract a rootstrap on a target using sb-menu. The rootstrap can either be selected from the local filesystem or downloaded via HTTP or FTP. If the file is located on the filesystem outside of Scratchbox, you can use the /scratchbox/tools/bin/sb-menu command to extract it outside Scratchbox. Go to the created 'hello-world-gtk' directory. where ipaddress is the address to the desired host and displaynumber is the host's X-display (typically 0). Allowing remote programs to use host's display is considered to be unsafe. This should be done only on trusted networks. The program should open a dialog that shows the 'Hello World!' text and contains a 'Close' button. In case the toolchain versions are changed, the users may need to create a new target or reconfigure an existing target to use the new compiler name (see Section 2.4). If Scratchbox is installed on a non-Debian system, you need to obtain newer packages  and extract them at the '/' directory. Upgrading Scratchbox from tarballs will not replace old toolchains if the toolchain versions have changed. If you want to remove the old toolchains, you can do so by removing the directories from /scratchbox/compilers by hand. All Scratchbox packages depend on scratchbox-libs so removing it with apt-get should be enough. It is recommended that you copy any valuable data from the users' home directories before removing Scratchbox. If Scratchbox was installed from tarballs, removing it is somewhat more complicated because Scratchbox mounts some directories from the host system to the users' sandbox directories. As a result of this, Scratchbox can't be removed by simply doing 'rm -r' (that would also remove files and sockets from the system's /tmp directory and break /dev if you were using udev). It is recommended that you copy any valuable data from the users' home directories before removing them. Scratchbox IRC-channel on freenode : #scratchbox. Scratchbox mailing list (see for more information). Commercial support is provided by Movial . How to Run Linux on iPAQ Handhelds, Jamey Hicks. Linux NFS-HOWTO, Tavis Barr, Nicolai Langfeldt, Seth Vidal, Tom McNeal. Scratchbox Remote Shell, Timo Savola. This is a list of Scratchbox specific environment variables that can be set by the user. Some of them are already set in /scratchbox/etc/profile. target system; "yes" or "no"
/tmp with sbrsh; "yes" or "no"
good choices are "sbrsh", "qemu-arm", "qemu-ppc", etc. should the compiler wrapper automatically use ccache? "yes" or "no"
to. Available versions are "1.4", "1.7" and "1.8" (default). set this variable under normal circumstances. This is a list of Debian devkit specific environment variables that can be changed by the user. Default values are set in /scratchbox/devkits/debian/etc/environment. provided by Scratchbox as valid build dependencies.